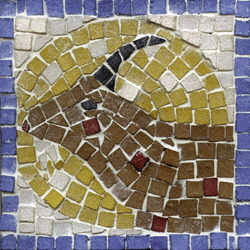 Signs of the Zodiac (astrological signs) were a popular theme for mosaics in Byzantine (late Roman) times. They were most often found together with Jewish themes on elaborately decorated synagogue floors. The most famous zodiac mosaics in the Holy Land are those in the synagogues of Hammat Tiberias (on the shore of the Sea of Galilee) and Beit Alpha in the Jezreel Valley.